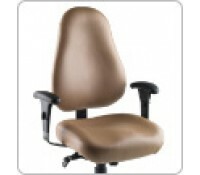 Free Shipping Biofit FSP-Series Intensive Plus Ergonomic Chairs with 500 pounds. capacity and executive-style comfort, this series is designed for continuous, 24/7/365 use and backed by a 5-year warranty. The sleek, large, saddle-shaped seat has a waterfall front to allow for even weight distribution. Generous and contoured, the backrest is molded to provide lumbar and kidney support. The polished, 5-point, star-shaped aluminum base affords even more support with 3 inch diameter, dual- wheel casters which are load rated at 165 pounds each (also available with glides instead of casters). Each Intensive Plus chair comes standard with an executive-style seat control with slider seat-depth adjustment. Backrest: Generous, contoured backrest: 20” wide x 23” high with lumbar and kidney support. Seat: Saddle-shaped, contoured 21” wide x 19” deep x 3” thick seat with sewn seams to help inhibit foam compression and maintain profile, waterfall front and internal seat board bumper guard. Controls: Executive Seat Control with Seat Slider: Pneumatic seat height adjustment, backrest height adjustment, seat and backrest swivel/tilt in unison, tilt- tension control knob and single-lever seat tilt lock in any position. Base: Polished Aluminum, 5-point, star- shaped base: 27” wide (26” caster to caster). Available with heavy duty glides (model FSP2025-IP) or 3” diameter, dual-wheel casters that are load rated at 165 pounds each as shown (model FSP2025-IP-IPR).